Figural or Pictorial representation: Included in this category are a large set of carvings that depict scenes from the Bible, contemporary life, or in some cases ancient mythological figures. 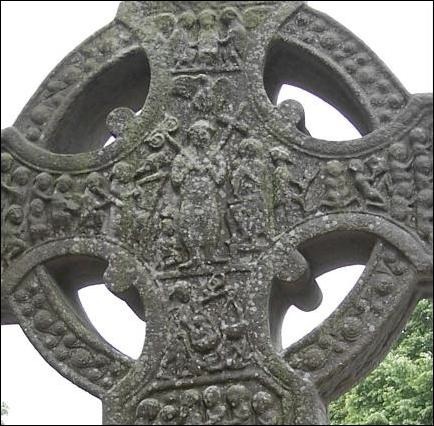 The example below left is the Cross of Muiredach at Monasterboice in Co. Louth. I have divided these into three categories: images from the Hebrew Scriptures, from the Christian Scriptures, and non-biblical images. We will briefly survey each category. First, I want to address briefly the version of the Bible that was in use in the western church in the early fifth century. This was the Bible that was introduced to the Irish. The Bible in the fifth century: In 807 a scribe of Armagh named Ferdomnach supervised the production of what is now known as the Book of Armagh. This volume contained the story of Patrick, the Gospels and Epistles and a life of St Martin of Tours. “This [book] is revered as being the oldest complete Irish copy of St Jerome’s Vulgate and brings us into contact with the Gospels and Epistles as read in the Early Irish Church.” (Slavin 90, 94, 101) The Vulgate was commissioned by the Pope and completed in about 405 (before the arrival of Saint Patrick in Ireland). It became the standard Latin translation of the Bible. This was, almost certainly, the Bible that was first introduced into Ireland. In the early centuries following its completion, there were very few complete copies. In addition, because it was written in Latin, only those who were well educated would have been able to read the text for themselves. This underlines the importance of the monasteries as educational institutions that preserved, produced and proclaimed the stories and message of the Bible. It also suggests a possible educational role for the so called “scripture crosses” (crosses that contained pictorial images from the Hebrew and Christian scriptures). Viewing these scripture crosses would bring to mind for the literate and non-literate the stories of the bible and to some degree their interpretation or meaning. There are many examples of Old Testament scenes on the High Crosses, but allow the following few to suffice to make the point. 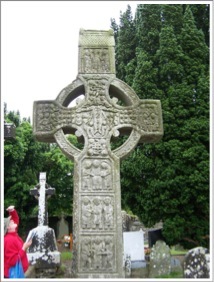 The image on the left is from Muiredach's Cross at Monasterboice (Co. Louth). 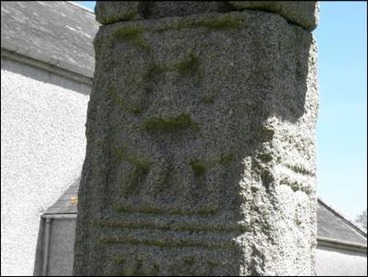 The image on the right is from the High Cross at Moone (Co. Kildare). The image on the left is described by Peter Harbison. “Adam and Eve are shown under the arcaded branches of the apple tree, its fruit falling down behind their backs. 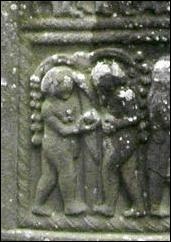 The serpent coils its way up the tree and turns to Eve on the left, whose right hand proffers the apple to Adam while the left hand hides her shame. Adam, bearded, stretches forth his left hand to receive the apple while using his right hand to hide his shame.” (Harbison 1992, 143; text in Genesis 3) Early Christians came to see the story of the fall as contrasting the first Adam and Christ as the new Adam. “For since death came through a human being, the resurrection of the dead has also come through a human being. For as all die in Adam, so all will be made alive in Christ.” (NRSV 1 Corinthians 15:21-22) The image of the Fall served as a reminder of the problem of human sin and at the same time foreshadowed God’s solution to that problem in Jesus Christ. The image above right represents the story of Daniel in the Lion’s Den. The text can be found in chapter 6 of the book of Daniel. In the image we see Daniel as the central figure with three lions on his left and four on his right. In the text angels protect Daniel from harm. Images from the Christian scriptures: [For a more complete assessment of the Christian Scripture texts that appear on the High Crosses see the features below entitled Christian Scripture Images; Imaages of the Fall, Biblical or Secular Images; Holy Week Images; the Crucifixion and the Resurrection.] Depictions of the crucifixion appear more often than any other image from the Christian scriptures. These scenes are almost always in the center of the head of the cross. In a good number of these we see the figures of “Stephaton the sponge-bearer and Longinus with his lance.” (Harbison 1992, 273) These are the names traditionally given to the two Roman soldiers, the first of whom offered Jesus a sponge filled with wine and the second of whom pierced Jesus’ side after he had breathed his last. In the examples to the left and right these figures appear in one but not in the other. The left image is from the west face of the Unfinished cross at Kells (Co. Meath), while the right image is from the east face of the west cross at Kilfenora (Co. Clare). 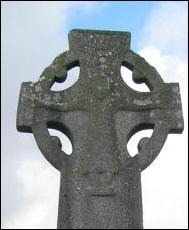 Not surprisingly, the apostles are another popular theme on the Irish High Crosses. 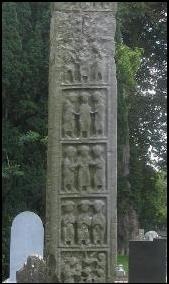 On the cross to the left, from the Tall Cross at Monasterboice (Co. Meath), they appear grouped in four successive panels. 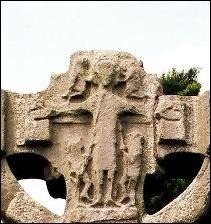 On the cross to the right, Moone (Co. Kildare) the apostles are grouped together on the base of the cross. These images offer an excellent example of scenes that are not related to any particular biblical text. The apostles are recognized only by the fact there are twelve of them in the group. Peter Harbison describes the scene: “In the centre, Christ stands with outspread feet and wearing a long robe to below the knees. There is an eagle above his head, with its head to the left and its left wing expanded. Christ carries a cross-staff over his left shoulder, and a blossoming scepter over his right. To the left of his feet there is a kneeling angel holding a book, and with another book above its head. Beside the angel, and looking to the right towards Christ, a harper – presumably David – sits playing the instrument which rests on his knees, while a bird perches on top of it and whispers into his ear – the inspiration of the Holy Spirit. Behind him is a man playing a flute-like wind instrument, while behind him again there is a man with an open book, probably to be understood as singing. The south arm is taken up with a number of seated or kneeling figures in long garments – the good who have been saved and who deserve a place in heaven. Non-Biblical Images: There are quite a variety of non-biblical images on the High Crosses. Some of these are religious in theme and others are not. Under the first category we have images that have been identified as various saints including St. Anthony (a desert father), St. Brendan (the Navigator) founder of Clonfert monastery, St. Columcille founder of Iona and many other Irish monasteries, and of course St. Patrick. The following photos each present a story about Saint Paul the Hermit and Saint Anthony of the Desert. While Anthony was visiting Paul “they noticed with wonder a raven which had settled on the bough of a tree, and was then flying gently down till it came and laid a whole loaf of bread before them. They were astonished, and when it had gone, ‘See,’ said Paul, ‘the Lord truly loving, truly merciful, has sent us a meal. For the last sixty years I have always received half a loaf: but at your coming Christ has doubled his soldier's rations.’” (Saint Jerome) The cross on the left is the Moone High Cross (Co. Kildare), the one on the right is from the South Cross at Castledermot (Co. Kildare). 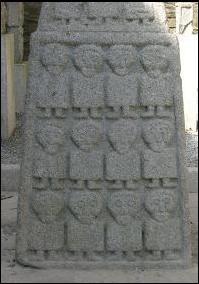 The later, mainly twelfth century crosses sometimes depict bishops or other ecclesiastical figures. In the year 1111 an all-Irish church synod was held at Rath Breasail. At this meeting the first diocesan structure for all of Ireland was established. This shifted the balance of power in church politics from the Abbots to the Bishops. While scholars debate whether the ecclesiastic images on some of the twelfth century crosses represent bishops, abbots or Christ as the bishop of the world, the results of the Synod of Rath Breasail suggest these images represent bishops in their role as the vicars of Christ. 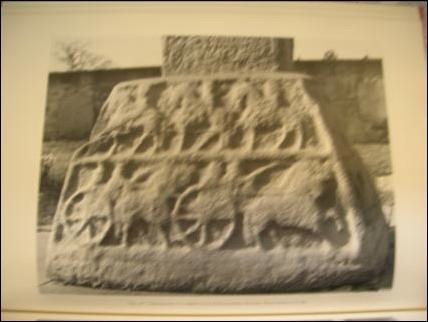 The two twelfth century crosses below offer representations of this type of image. 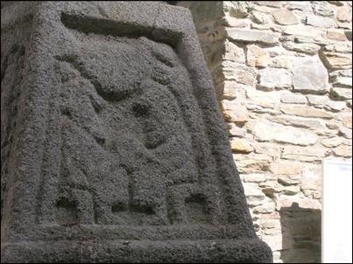 On the cross to the left, from Dysert O’Dea (Co. Clare) the figure of the bishop is just below the image of the crucified Christ. On the cross to the right, from the Doorty Cross at Kilfenora (Co. Clare), the bishop is the main feature of the east face of the cross. A crucifixion scene appears on the west face of the head of this cross. 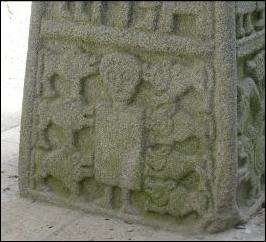 The illustration on the right is an artists rendering of the image on the Doorty High Cross at Kilfenora, (Co. Clare). It appears on an interpretive sign at the site and shows the image clearly. 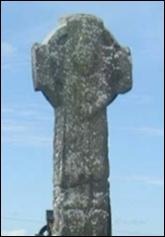 There are also figural images on some of the Irish High Crosses that may not be religious in content. The east face of the base of the Cross of the Scriptures at Clonmacnois (Co. Offaly) offers an excellent example. Here is how the scene on the lower panel of the base is described by Peter Harbison: “Two chariots, with large 8-spoked wheels, and probably drawn by two horses apiece, proceed toward the right. In addition to the charioteer, who holds the reins, there is one passenger in each vehicle.” The photo is also from Peter Harbison. (Harbison 1992, vol. 1, 48; vol. 2 photo) Harbison notes on the same page that at least one scholar has sought to identify this image with the Exodus.